Bruce Lee's life, philosophy, and final film are examined in this reverent documentary, which traces the master's path through the development of his own style, his battles with mainstream Hollywood and martial arts traditionalists, and his emergence as the world's top box-office draw. Just as interesting as Lee's life is the chance to see lost footage from The Game of Death, Lee's final, unfinished film. Outtakes offer the opportunity to see Lee's perfectionism in action, and the reconstructed storyline reveals how Lee's personal martial arts philosophy shaped the film. And yes, there is a spectacular nunchakau fight. Interviews with Lee and those close to him highlight his energy, intelligence, and remarkable charisma. Fans of Lee will welcome this new insight into his filmmaking, and those unfamiliar with his life and work will come away with a new respect. The DVD includes a Lee filmography, the theatrical trailer for The Game of Death, and audio commentary by the director. The first half of the film explores Bruce Lee's background and evolution in martial arts, from his beginnings in traditional kung fu to the development of Jeet Kune Do. Included in this half of the film is some never before seen footage of Bruce Lee in training and in demonstrations, excerpts of an interview with the master, along with some interviews with some of the important people in his life. Along with this is a brief chronicling of his journey into superstardom, culminating in an explanation of how Bruce Lee intended Game of Death to be seen through the reviews of Bruce Lee's very own notes on the film. From his notes, the lost footage of Game of Death was skillfully put together for the conclusion of this DVD. The second half of this film, the conclusion, is where the never before seen footage of Bruce Lee's Game of Death is shown. Needless to say, the master's original vision of this film was fantastic, and had he completed this movie, it definitely would've been his best. And although Hong Kong martial arts films today have evolved so much since the time Bruce Lee came on the scene, the fight scenes choreographed and filmed by Bruce Lee still stand up as being some of the best fight sequences ever filmed. Also, for those of you who are film buffs, you'll be delighted to know that although the majority of the DVD is shown in full screen, the original Game of Death footage on this DVD has been presented in the original widescreen format. So although the disc jacket says this film is in full screen, only the documentary portion is. The Game of Death footage, which I bought the DVD for (and what I know most of you will be buying this DVD for), is preserved and shown the way it was meant to be seen. So what are you waiting for? 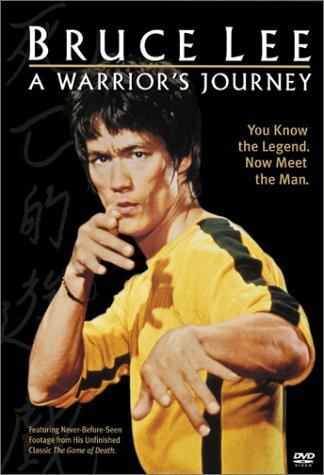 All you Bruce Lee fans, get this DVD!!! And all of you martial arts fans, buy this DVD!!! You won't be disappointed!!! Long live the master! Long live the Dragon! Long live Bruce Lee!